Cisco estimates that the Internet of Everything (IoE) — the networked connection of people, process, data, and things — will generate $19 trillion in Value at Stake for the private and public sectors combined between 2013 and 2022. More than 42 percent of this value — $8 trillion will come from one of IoE’s chief enablers, the Internet of Things (IoT). Defined by Cisco as “the intelligent connectivity of physical devices, driving massive gains in efficiency, business growth, and quality of life,” IoT often represents the quickest path to IoE value for private and public sector organizations (see https://www.iotwf.com/iotwf2014/deployment_map for more than 250 examples of global IoT deployments). 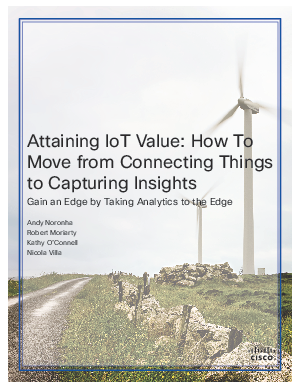 This paper combines original and secondary research, as well as economic analysis, to provide a roadmap for maximizing value from IoT investments. It also explains why, in the worlds of IoT and IoE, the combination of edge computing/analytics and data center/cloud is essential to driving actionable insights that produce improved business outcomes.